Expats living in polluted cities are at an increased risk of suffering a second heart attack. The risk of suffering a second heart attack increases 40 percent if you live in an area with high air pollution. Air pollution, while being bad for the environment, is also linked to respiratory infections, lung cancer and heart disease. A study from the University of Tel Aviv has found pollution impacts cardiac events and stroke, and can cause repeated episodes over time. The study found cardiac patients living in high pollution areas were over 40 percent more likely to have a second heart attack when compared to patients living in low pollution areas. The study aimed to determine the long term risks for heart attack patients living in polluted areas. Monitoring over 1,000 first time cardiac patients under 65 years of age in 1992 and 1993, the researchers followed up with them again in 2011. They found those who lived in the the regions of highest air pollution were 43% more likely to have suffered a second heart attack or congestive heart failure than people in cleaner areas. Nearly a half (46%) were more likely to have suffered a stroke than those in low pollution areas. Patients exposed to more pollution were 35% more likely to have died in the 19 years after their first heart attack. “The results of the study not only indicate a health benefit for a public policy that curtails air pollution caused by industrial emissions and second hand smoke, but also call for heightened awareness by clinicians. 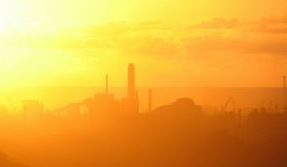 Doctors should be making their patients aware of the risks of remaining in high pollution areas, suggesting that they work to limit their exposure,” Dr. Yariv Gerber, of Tel Aviv University’s Public Health Department, suggests. There are several popular expatriate destinations that score poorly on international air quality tables. Hong Kong – The Air Pollution Index, which rates the likelihood of people getting ill due to air pollution recently reached 500 – the highest score possible. Los Angeles (metropolitan area) – This U.S city has some of the worst air pollution in the country. In the American Lung Association’s (ALA) State of the Air Report 2010, the region was named the worst in the country for ozone pollution. Breathing ozone is akin to getting sunburn in your airways, according to the ALA’s chief medical officer. Beijing – Unsurprisingly, several Chinese cities feature highly on the Air Pollution Index. Beijing is one of the worst for air pollution, along with Chongqing and Guangzhou. Mexico City – Mexico City has the highest level of ground-level ozone in the world, according to the World Health Organisation. Worryingly, it also has high levels of almost all major, harmful airborne pollutants, say researchers at the University of Salzburg.